Cottage with corrugated iron hip roof, bluestone front wall, and red brick side wall on Kenton Street (and presumably on the north side). The roof is hipped of corrugated galvanised iron, with a plain central brick chimney. The front verandah is concave corrugated iron, and has timber posts and cast iron decorative brackets and shallow frieze. There are rendered and banded quoins and rendered and painted door and window surrounds; door and windows are timber-framed, the windows of double-hung sash. The assessment includes the original structure and form of the cottage beneath the hipped roof, the front verandah, and traditional treatment of window and door surrounds. The house is a private home. This building has been assessed as meeting local heritage criteria in accordance with the Development Act (1993). 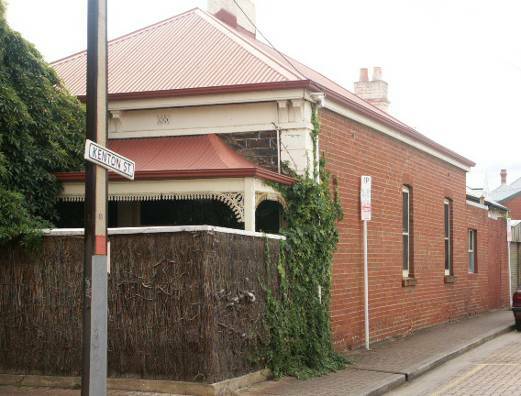 However, despite its nomination for heritage listing by the Adelaide City Council, the Minister for Planning has refused to approve the listing, leaving this building without heritage protection. This item is of heritage value because it is an early dwelling that retains original fabric, reflects original form and features of the early residential occupation of the area and complements other dwellings in the area. It illustrates several key themes in the city’s history: 2.4 City Dwellers: Householders, Boarders and Tenants; 4.3 Development of the Building Industry, Architecture and Construction; 4.5.2 Victorian Houses (1870s to 1890s); 4.6 Heritage and Building Conservation. This cottage was erected on portion of Town Acre 351 that was originally granted to GF Angas and others (the South Australian Company) on 23 December 1837. In November 1881, the registered owners of the still vacant land—measuring 212 ft x 191 ft—were Arthur Lucas Harrold, Samuel Cornish and Henry Dunkin O’Halloran, all noted as gentlemen of Adelaide. Shortly after, in July 1882, Simpson Newland, member of the South Australian parliament, and Charles Burton Hardy, solicitor of Adelaide, purchased the property. They remained owners until February 1890. In April 1893, land and estate agents Frederick Bullock and James Viner Smith purchased the vacant land. It appears that it was at this stage that the land was subdivided and a portion—now measuring 20.6 ft x 90 ft—was purchased by Alfred Bailey, coachman of Adelaide, for £390-8s, in August 1893. It seems likely that Bullock and Viner Smith erected the cottage for Bailey as assessment records for 1895 (adopted 17 December 1894) note Alfred Bailey owning and occupying a house in Cardwell Street with an annual assessed value of £18. Building Surveyor’s Notices indicate that a notice was received by Council on 19 September 1893 noting that builder FW Bullock & Co. was responsible for the construction of a cottage in Cardwell Street on Town Acre 351 at an estimated cost of £350. It is likely that this notice refers to this cottage.